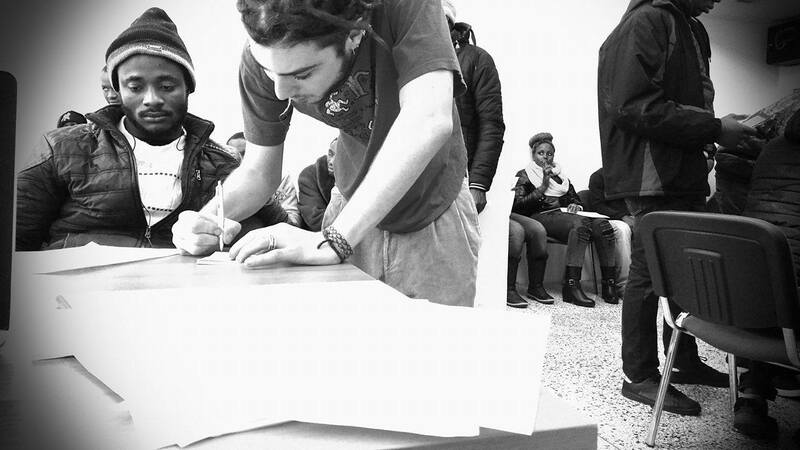 30 people were gathered in the offices of Generation 2.0 RED, a space within 30m2, to use computers and internet provided for free to communicate with the Asylum Agency and get that hot-shot interview for international protection. The procedure is this: for every language and country of origin, there are specific hours to make an appointment through skype, one of the most basic steps to apply for asylum. From 10-11am were the skype hours for Urdu and Panjabi, mainly for people coming from Pakistan and India. Five people were calling continuously for a whole hour to the skype account for Urdu, but no one answered. From 11-13.00 it was the time for English and French, mainly for people from African countries. 25 people came, some of them had already come more than once by our office in order to make sure that they will be the first to get the appointment. After a while of trying, the first one achieved to make an appointment for the 3rd of March (!) and other four people for later on. The rest of them not only did not manage to get an appointment that day, but will not make it neither next week, because the asylum service cannot accept more calls. We asked them where they were living and they said in the streets or in camps. We asked them what they were doing until they came to us to get an appointment though skype. They told us that they went to cafeterias and internet cafes, paying to drink something in order to call by themselves. But they never got an answer. Many of them explained to us that their service notes, meaning the paper which is given to them when they arrive in the country and has a duration for only a month until the asylum process begins, had already expired. The way the system works, it is sure that there is no way they are going to make an appointment while the service note is not expired, because the procedures last much longer than a month. The reality is, from the moment they get out of our office, they risk of getting arrested if a police officer asks for their papers. People, women and men, like you and me, mainly up to 30 years old, who have travelled under extremely difficult conditions, arrive in our offices with the hope of making this very important appointment. But they leave completely disappointed and alone. The staff deficiencies in the Asylum Agency is a big problem for both the agency and its employees, who make great efforts to serve as many people as they can, and also for us who wish to help, but the way the system works does not allow us to. And we have to tell these people, who are alive only by a miracle, to be patient (!) until next week to make the one in a million appointment after a couple of months. Here follows the outcome of a day in our office and the thoughts if Giorgio Agamben from the “We, the refugees” with the hope you will see what the real problem is in this difficult situation that Greece is facing. The refugees or the inadequacy of the asylum system?